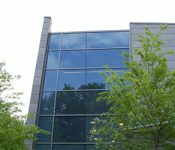 Part One focused on the common issues that plague older commercial windows, the challenges of restoring them and how to know when it’s time to replace windows. Part Two focuses on the best method of replacing older commercial windows, and the concerns and common issues with historic window replacements. One option for window rehabilitation projects is the use of true divided lites; however, this poses some difficulties. Because the frame is not thermally broken, temperature transfer remains an issue. 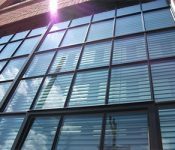 When multiple lites are installed, the overall glass costs increase, along with the glazing time and labor costs. The load deflection is poor and the structural integrity less efficient. Further, the process doesn’t allow for the industry standard 1/8 inch spacing between glass edge and spacing bar, which is needed to facilitate glass expansion. This makes it more difficult to maintain consistent sightlines, and exposes the spacer. The greater number of lites and the exposed spacers create more opportunities for UV light damage and seal failure. Therefore, the most strategic method for historic window replacements is a simulated divided lite system. This uses applied grids to replicate historic products. This maintains the historic integrity of the building intact by achieving sightlines of 7/8 inch or narrower. In fact, dimensions can be adjusted to exact requirements – as low as 3/8 inch. In the simulated divided lite system, the spacer is not exposed and potential whistles or rattles are eliminated. Most importantly, the frame is thermally broken, the insulating glass is not thermally compromised, and the limited glass perimeter reduces air and water infiltration. In one example of such a replication is the restoration of Brooklyn Army Terminal, formerly referred to as the ‘US Army Military Ocean Terminal’ or the ‘Brooklyn Army Base’ which once served as the largest military supply base in the US through WWII. Today, Brooklyn Army Terminal is a fully functioning commercial/industrial complex and features over 700 SCW 2500 Series historic windows with simulated operating vents. 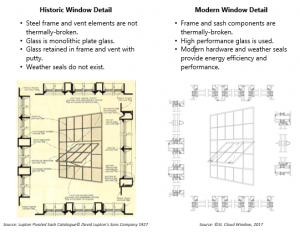 When your project requires historic window replication, it is possible to replicate the historic features with strict attention to detail, while also meeting modern acoustic, thermal, structural performance and compliance requirements. Get in touch to learn more about St. Cloud Window’s historic replication windows.